Amazon claims that it is the number one e-commerce website in India now as per the ComScore desktop data on May, 2015. To celebrate this they are giving away Amazon Gift Card worth INR 100 for Free. The giveaway is based on some terms and conditions, let us have a look on what are they. You will have to buy something from Amazon India today (July 02, 2015) to avail this offer. The gift card will expire with in one year from the issue date. This offer ("Offer") is valid from 12: 00 A.M., July 02, 2015 to 11: 59 P.M., July 02, 2015. So in simple words you can get INR 100 to buy something else from Amazon if you make a purchase today. So if you planning something to buy, you can do it today and save INR 100. 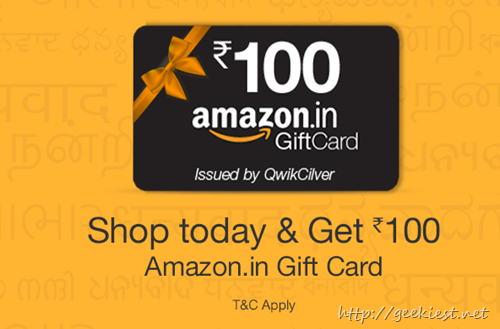 Get INR 100 worth Giftcard from Amazon India for FREE if buy something today.